The final adventure begins. From Disney and Producer Jerry Bruckheimer comes the harrowing and thrilling PIRATES OF THE CARIBBEAN: DEAD MEN TELL NO TALES. 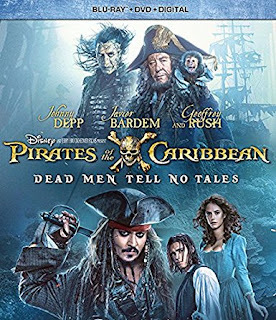 Set sail with Captain Jack Sparrow (Johnny Depp) as deadly ghost sailors, led by the terrifying Captain Salazar (Javier Bardem), escape from the Devil's Triangle bent on killing every pirate at sea -- notably Jack -- in an epic story packed with humour, suspense and amazing special effects! I have been a fan of the Pirate Of The Caribbean movies since the very beginning. I have seen them all in theatre and I own all the movie on Blu-ray. Yes I have watched all of them a bunch of times and I know I will watch them all again and again in the future because I enjoy the movies. PIRATES OF THE CARIBBEAN: DEAD MEN TELL NO TALES I found to start a little slow at first but after a while, the story picks up and got me enjoying this movie. I loved the special effects, the acting and this story. It has cheesy humour just like the previous movies.